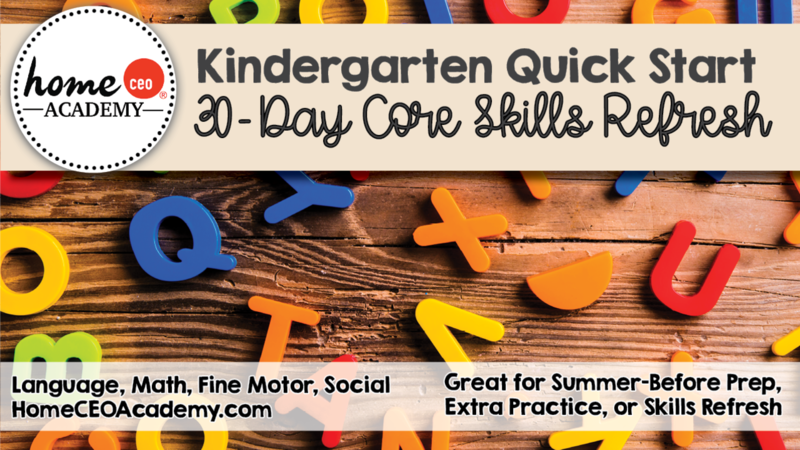 Perfect for the summer before Kindergarten or extra skills practice, this quick and easy 6-week program is the ultimate one-stop Kindergarten prep program. This program offers 30 instructional days of both no-prep and low prep activities to prepare your children for Kindergarten success. This program is perfect for a summer-before-Kindergarten prep program or as a refresher in the first weeks of Kindergarten. Best of all, each day offers a completely no-prep option for parents, preschools or Kindergartens pressed on time. This printable Kindergarten readiness program focuses on the essential academic and social/classroom skills needed for your child's Kindergarten success. As a teacher, you'll utilize two core tools: a binder and a board. You will recieve all the printables you'll need to create a Kindergarten Circle Time Board, tailored to this program, that you'll use daily and all kindergarten prep printables organized and in perfect order so you can simply print and teach! Please note: Though many of these activities are specific to this program, many of the kindergarten prep activities are selected activities in our Age 2-3 and Age 3-4 Complete Year programs. The difference with this program is that the scope and sequence, daily summaries and complementary materials have been tailored and consolidated to zero in on the absolute essentials new Kinders need. This Kindergarten prep program offers an easy, straight-to-the-point plan and printables for learning at this critical juncture. This program can also be used as a refresher tool for children currently enrolled in Kindergarten. You will receive a 30-day program map and a 15-day program map. This serves as a visual aid to understand the scope and sequence of our Kindergarten Quick Start prep program and it also serves as a checklist to keep you on track. Write in the date you complete each day's Kindergarten prep activities. 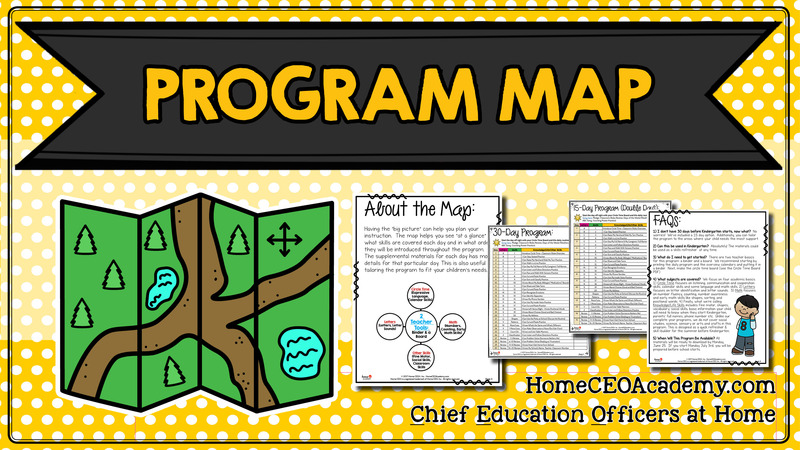 You may even wish to reward your students as they complete learning milestones on the program map. This Kindergarten prep program uses a Circle Time routine to start the daily activities. It is a great way to start your homeschool or kindergarten classroom. 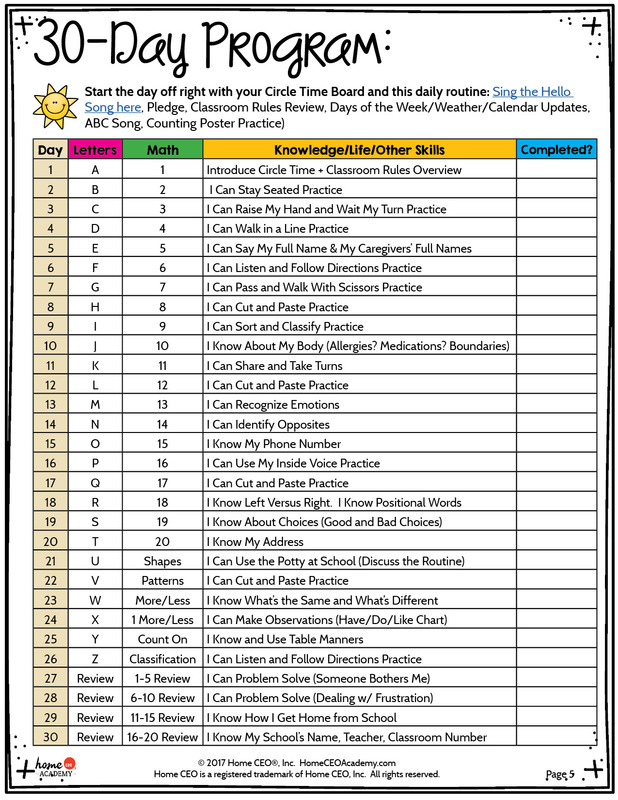 Each day begins with a review of the days of the week, weather, ABCs and 123s as well as reviewing key information your child will need fluency in when they attend Kindergaten (basics like their full name, caregiver's full names, contact information, classroom rules and expectations, pledge of allegiance, etc). Our Kindergarten Circle Time routine enhances oral language skills and provides opportunities to practice protocols for classroom group-time. 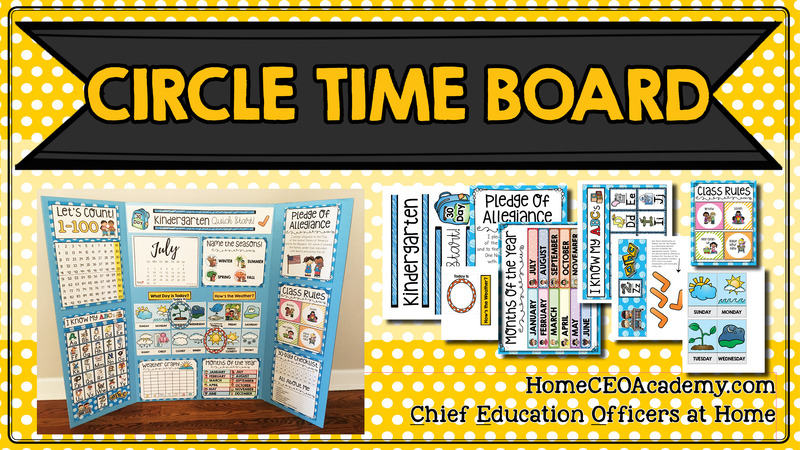 We provide all the printables and step-by-step instructions to recreate the below Kindergarten Circle Time Board. All you will need to do is purchase a 36"x48" (when opened) science project board. The meat of our Kindergarten readiness program are our Daily Work Packets! Each day, you have a PDF with a checklist and all the assignments for the day. You have a choice of three language, three math and one life skills activity to do with your new Kindergartener (or soon to be Kinder). Often we also include additional bonus activities. There are entirely no-prep options as well as low-prep options. Simply choose which activities fit your schedule. The lessons take on everage 30-60 minutes per day depending on the amount of activities you choose to do. (If you do the condensed 15-day option, the time spent is doubled). The activities we include in the Daily Work Packets are very creative and engaging. They include our popular uppercase ABC letter crafts and our Funny Phonics books that will get your children excited about language and phonics. Our math activities cover counting 1-100 and a detailed review of numbers 1-20. Your children will also practice early math skills including patterns, shapes, sorting/classification, one more/one less, greater than/less than, and number families (early addition). In addition to language and math skills, our Life Skills component is very important because academics is only one aspect of Kindergarten. You and your children will practice and hone a variety of skills in fun and engaging ways including classroom rules (I Can Raise My Hand, I Can Use My Inside Voice, I Can Stay Seated Practice, etc) as well as social skills such as dealing with frustration or what to do if someone bothers you. We also cover the necessary optional "touchy" subjects such as ensuring your child understands the procedures for how to go potty at school and also understands his or her boundaries when it comes to our bodies (knowing what is private and not private), as unfortunately, these concepts need to be covered as our children become more independent and are exposed to more people. For all of our life skills lessons we provide teaching scripts, practice activities, and posters with clear and direct steps to help your child remember what's most important. You can modify any life skills activity as needed. I don't have 30 days before Kindergarten. Now what? We have a 15 day option that will have your child amply ready for Kindergarten if they start as late as July 31. Can this be used in Kindergarten? Absolutely! This program would make a great review even after Kindergarten starts. It could be used as a skill-builder or refresher for the first 30 days or anytime your children need extra practice. What do I need to get started? We recommend two teacher essentials: a binder and a board. The binder is where you'd store your printouts if you choose to print in advance. The board is our recommended Circle Time Board. We provide all of the printables for that board with step-by-step directions on how to assemble it easily on a 36x48 science project board, where all the printables fit perfectly. If you want to keep your child's work in a growing notebook (optional), you'll need a composition notebook or a spiral notebook. What subjects are covered? This is an essentials program. We cover language arts (letters, letter sounds, CVC wordcs), math (numbers 1-20, counting 1-100, and many other early math skills - see program map above), and life skills which involve things like knowing your name, contact information, how you get home, classroom rules, dealing with frustration, understanding classroom etiquette, etc. The life skills work includes say/do practice pages (teaching scripts and practice suggestions). The life skills work also includes several posters to help children remember key lessons. Will I receive anything in the mail? No. This is a printable program. It is available as an instant download upon purchase. I'm Ready to Start, How Do I Purchase? That's great to hear! It is never a waste to invest in education. Simply scroll to the green button that says "Purchase Offer" and follow the steps. After checkout, you will receive INSTANT ACCESS to our Kindergarten Quick Start curriculum library where you'll have 24/7 access to download your documents at any time. If you have any questions at all about this program, email us anytime at support@homeceoacademy.com or call 877-853-1552 and we'd be happy to help. Home CEO Academy is a social enterprise and we donate all profits (100%) to 20 charities (39 since inception) that make improvements in the areas of poverty, education, human trafficking and more. Most recently, we sponsored a playround in Uganda through a partnership with East African Playgrounds. Learn more about who we support here. 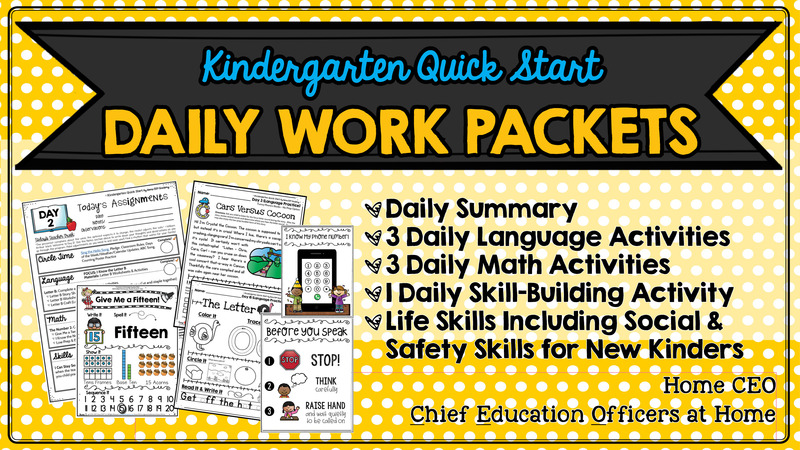 Includes Program Map, Circle Time Board and 30 Daily Work Packets. Digital edition / PDFs. No product is mailed.